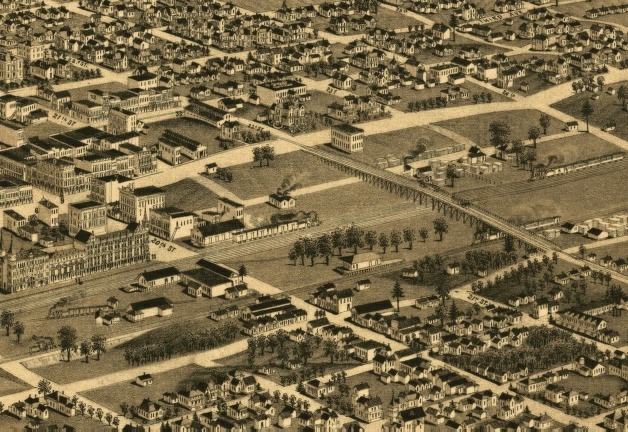 Moving on to the east, this view shows the original 22nd Street Viaduct. This wooden structure carries vehicles, pedestrians and the new streetcars across the railroad reservation without the danger and delay associated with the trains. In the coming years, the City leaders would work hard to build additional viaducts across the tracks. Eventually, the tracks themselves would be raised, and underpasses as well as viaducts would be used to cross the busy railroad corridor.